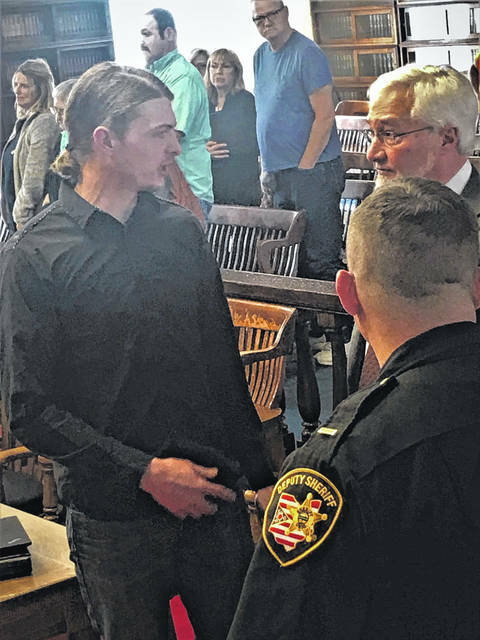 The first trial dates for two members of the Wagner family charged with indirect involvement with the murders of eight members of the Rhoden and Gilley families in Pike County in 2016 were set in late March. Pike County Common Pleas Judge Randy Deering named July 8 as the first day for a jury trial for defendant Rita Newcomb. A jury will begin debating the fate of Fredericka Wagner July 29. However, the trials of the four defendants directly charged with the 2016 massacre seem likely to be many months away. On Thursday, charged with 23 criminal counts most notably including eight counts of aggravated murder, Edward Jacob Wagner was before Deering for his third pretrial hearing. Edward Wagner verbally waived his right to a speedy trial. According to Deering, Ohio law requires criminal trials to begin a maximum of 270 days after an initial arrest. Because Wagner waived his right to a speedy trial, Deering said his trial could begin as late as Jan. 31, 2020. Although Deering has barred officials related to the case from speaking with the media, numerous court observers seem to feel the other Wagner defendants charged with the eight murders and each facing the death penalty, also likely will further waive their right to speedy trials. According to comments made previously by The Ohio State University Moritz College of Law professor Douglas Berman, advertised by OSU as an expert in death penalty cases, waving of a speedy trial is a means used by defense attorneys in order to gather as much information, or discovery, from prosecutors as legally possible. It is also a tactic used to give defense attorneys the maximum amount of time to prepare their defense. Each of the Wagner defendants directly charged with the murders has filed any number of requests for discovery as well as so-called bills of particulars, basically further requests for evidence believed held by prosecutors. Just how much information might attorneys for both sides need to sift through? At a pretrial hearing for defendant George Wagner III, defense attorneys stated they had received 30 gigabytes of materials, adding that amount was merely a “small chunk” of the information they had asked for and expected to receive. According to documents obtained by the Daily Times following Wagner III’s pretrial, some discovery already asked for by the defense team covered a wide array of materials such as autopsy reports for seemingly each of the victims, to include x-rays of those victims, as well as autopsy photos, which in some instances number as high as 140 for an individual victim. Further materials listed include 530 photos taken during the execution of a search warrant at an address on Peterson Road in Pike County. Wagner III’s defense team also asked for photos from each of the murder sites, along with what’s named as 3D scans of those murder sites. The discovery list totals the amount of materials asked for in at least two places in the paperwork provided by the court. At one point, the total reaches 2,448 pages, two videos, 18 audio files and two 3D scans. A second running total lists 2,665 pages plus one video. While they await an actual trial date, Edward Wagner’s attorneys, as well as the attorneys representing the state in the case against the various Rhoden murder defendants, will meet in a status conference on the case of Edward Wagner early the morning of April 16. According to a Google search, status conferences in criminal proceedings generally involve discussions among the attorneys and the judge in an attempt to determine the progress and direction of the case, largely to include various evidentiary issues. Such hearings generally are open to the public. In this instance, with the agreement of defense attorneys, Jake Wagner will not be present at the April 16 hearing. His attorneys indicated they would advise their client regarding the happenings at that status hearing at a later date. Wagner will need to be back in court for his fourth pretrial hearing scheduled for May 14. The case against Edward Wagner may prove key to the prosecution in all of the Rhoden murders. Prior to the imposition of the gag order imposed by Deering, then state Attorney General Mike DeWine told the media at a press conference announcing the arrests of the various members of the Wagner family, a custody battle over the child of murder victim Hanna Rhoden, who was 19 at the time of her death, and Edward Wagner, may be at the heart of the motive for the murders. Both grandmothers in the Wagner family, Rita Newcomb and Fredericka Wagner, are facing charges of perjury and obstruction of justice allegedly in connection with testimony the two gave to an investigative Pike County grand jury looking into the Rhoden murders. Newcomb faces an additional charge of forgery, possibly having to do with faked custody papers relating to the child of Edward Wagner and Hanna Rhoden. One of the charges against Edward Wagner includes sexual conduct with a minor, namely Hanna Rhoden.